Many private institutions, such as universities and museums, have large and growing endowments. Why doesn’t the government have one? Simply, we have failed to take advantage of enormous opportunities to create one. 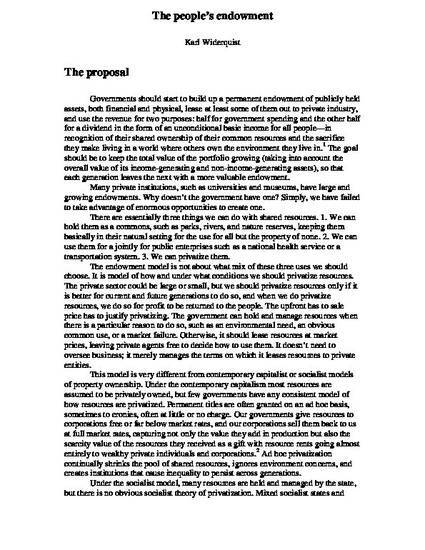 This paper argues that governments should start to build up a permanent endowment of publicly held assets, both financial and physical, lease at least some of them out to private industry, and use the revenue for two purposes: half for government spending and the other half for a dividend in the form of an unconditional basic income for all people—in recognition of their shared ownership of their common resources and the sacrifice they make living in a world where others own the environment they live in. The goal should be to keep the total value of the portfolio growing (taking into account the overall value of its income-generating and non-income-generating assets), so that each generation leaves the next with a more valuable endowment.